← July 4th: We’re You Hot in Cleveland? Winner of the Open Table “Diner’s Choice” Award is Hot in Cleveland. Cleveland's Answer to 'Cheers' and More! At John Q’s on Public Square everyone may not ‘know your name’ as the old Cheers song goes, but the proprietor, Rick Cassara, will always get it right. He’ll even greet you at the door or drop by your table to say thanks for dropping-in. 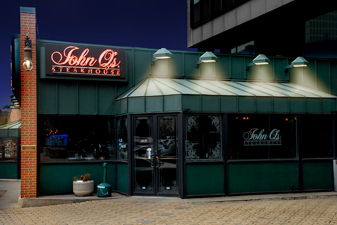 Bump into an old friend or make a new one at John Q’s Steakhouse, winner of the 2011 Open Table “Diner’s Choice” Award, in downtown Cleveland. This is where both downtown residents and Cleveland’s movers and shakers meet, where out of town conventioneers or evening game-goers gather for some of the best steaks and fish anywhere. 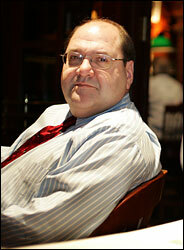 John Q's owner, Rick Cassara, brings a personal touch. The uniquely prepared pan-fried Canadian Walleye is my personal favorite – lightly breaded and served with a delectable lemon chive beurre blanc. When someone said that, “the best restaurants in Chicago are in Cleveland,” no doubt, John Q’s was one of the places they had in mind. Enjoy John Q’s Public Square patio in summer or the warmth of its oak and brass interior anytime. Looking for intimate, request one of the more private and cozy booths – train-like in compartmentalized style, where you can literally draw the burgundy, velvet curtain on the outside world. Great service and food preparations, top shelf beverages and select wines, and easy-going patrons fill this Cleveland classic destination with light-hearted laughter and the perfect way to unwind at the end of the day. Wouldn’t you like to go? Wouldn't you like to go . . . to John Q's in Downtown Cleveland. This entry was posted in Cleveland Rocks!, Hot in Cleveland and tagged Cheers, Downtown Cleveland, John Q's, Rick Cassara, Steakhouses Cleveland. Bookmark the permalink. 1 Response to John Q’s: Cleveland’s Answer to ‘Cheers’ and More!